Classes were cancelled until the situation is sorted out. 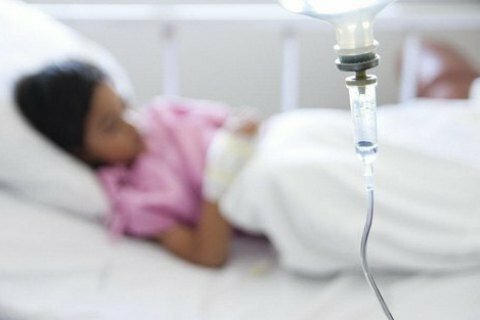 Forty-two children got poisoned with an unknown substance in Cherkasy secondary school No 8, the State Emergencies Service (SES) has said on its website. The first three children were hospitalized at 9.15 a.m. after losing consciousness at a school event. "By 11 a.m., 42 children have been hospitalized. All of them are students of Grades 2-7. A preliminary diagnosis is poisoning with an unknown substance," the SES said. Chemical, radiological and bacteriological experts, representatives of the Security Service of Ukraine (SBU), police and authorities are working at the scene. An express test of air showed no trace of hydrogen sulfide, ammonia, chlorine, combustible gases or poisonous substances. Classes are cancelled until the situation is sorted out. A criminal case was opened over "violation of sanitary rules and procedures for prevention of infectious diseases". Prime Minister Volodymyr Groysman flew to Cherkasy "to sort out the situation with children's health", as he said on Twitter. Acting Health Minister Ulyana Suprun headed for Cherkasy too. President Petro Poroshenko ordered relevant bodies to find out how the children got poisoned and provide them with urgent medical help. By 1 p.m., the number of hospitalized school students has reached 51, according to the Health Ministry's press service. By 2.30 p.m., 53 pupils and two teachers have been hospitalized. Eleven children are in intensive care. Their condition is described as medium grave, others are in satisfactory or light condition. Psychologists are working with the children's parents.